These pendant controls are designed and manufactured in Italy, and are perfect for the control of electric overhead travelling cranes, chain hoists, monorails, and wire-rope hoists. We stock standard models to suit these machines for immediate delivery. 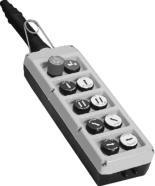 We also custom-design pendant controls to meet your specifications. Our unique process allows us to create rugged customised labels for controllers with rapid turn-around times - engraving not needed. All pendant controllers are housed in double-insulated high-impact thermoplastic, and sealed to IP65. Rapid and simple to assemble and cable, these pendants greatly reduce complexity for the installer. Among other thoughtful features, cable retainers are supplied so that internal wires are not pinched when the enclosure is closed. Choose from a variety of actutators: - One-speed and Two-speed buttons - Latching and momentary rotary switches (2 and 3 position) - Pilot Lights - Key switches - Potentiometers All pendant kits are supplied with mechanical interlocks that allow adjacent buttons to lock each other out - these can be omitted if not needed. Each mounting location allows for up to 3 contact blocks to be fitted - one element deep only. In the case of 2-speed buttons, this also allows a NC contact to be fitted for electrically interlocking if desired. 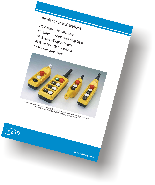 Download the catalogue, or give us a call to discuss any special requirements.